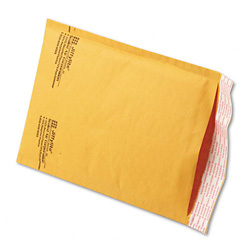 Jiffylite® bubble mailers provide outstanding low cost shipping protection for a wide variety of products. Jiffylites® are made from recycled golden kraft paper with a 3/16" Bubble Wrap® lining. Peel and stick lip provides a secure, tamper evident closure. - Usable dimensions are 7 1/4" x 10 3/4". - Each mailer weighs only .7 ounces. - Sold in case quantities. Can't find what you're looking for or need a custom quote? We're here to help you out! Simply fill out the form below and we'll get back with you as soon as possible. Copyright © 2018 Shipping Supply, LLC. All Rights Reserved.